1 or 2 Bedroom Suite at Liki Tiki Village Near Disney in Orlando, Florida! 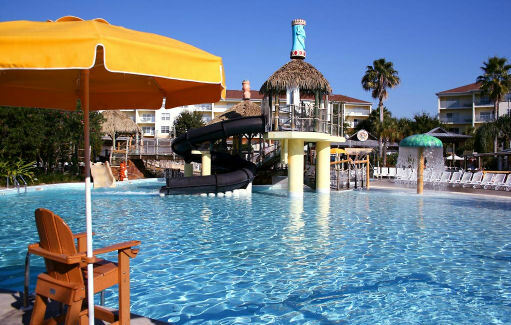 Liki Tiki Village Near Disney in Orlando, Florida - Bid on a 7 Night Stay in a 1 or 2 Bedroom Suite! Enjoy 7 Nights in a 1 or 2 Bedroom Suite at Liki Tiki Village Near Disney in Orlando, Florida! Explore our 64 acres of lush landscape, stroll around the Polynesian-themed complex, and absorb its tropical beauty. Join your children in a pirate adventure at Liki Tiki Lagoon Water Adventure, an on-site water activity adventure, play mini golf, or stop for a bite to eat at Shipwreck Sally's Bar & Grill. Ride around the lake in a paddle boat, play a game of tennis at one of our two courts, or rent a movie or a bicycle. For a little competition, challenge the kids to a round of video games or one-on-one basketball, if you think you've got the moves. There's plenty to do without leaving the resort. Liki Tiki Village's condos are furnished with all the comforts of home. Rest in the queen-sized bed, revitalize in the whirlpool-style tub, spread out in the living area, and view your favorite show on the large, plasma TV. TVs are located in the living area and the bedroom. The fully-equipped kitchen provides the ease of preparing a snack or full meal. A washer and dryer are conveniently located within the unit for your use. Your 1 Bedroom Condo comes with a full kitchen and will accommodate up to 4 people. Your 2 Bedroom Condo comes with a full kitchen and will accommodate up to 6 people. At The Harbor, you can play a round of tropical mini golf or shuffleboard, then cruise the lake in a paddle boat. Monday through Friday, Liki Tiki Village provides a full agenda of arts and crafts fun for the children. REQUIRED SURCHARGES: Daily, resort fee: USD 19.13 including tax. Fee covers use of Wi-Fi, in-room safe, local telephone calls, Liki Tiki Lagoon, mini golf, water park access, paddleboats, sports equipment. This fee is per unit per day, and is collected at check-in.